SVT (Swedish Television) went straight to Apple’s CEO Steve Jobs in December 2009 while waiting for Apple to approve the company’s iPhone app. Sign-bearing Swedes stood outside Apple’s headquarters in Cupertino, California, asking Steve to help speed up the application process. 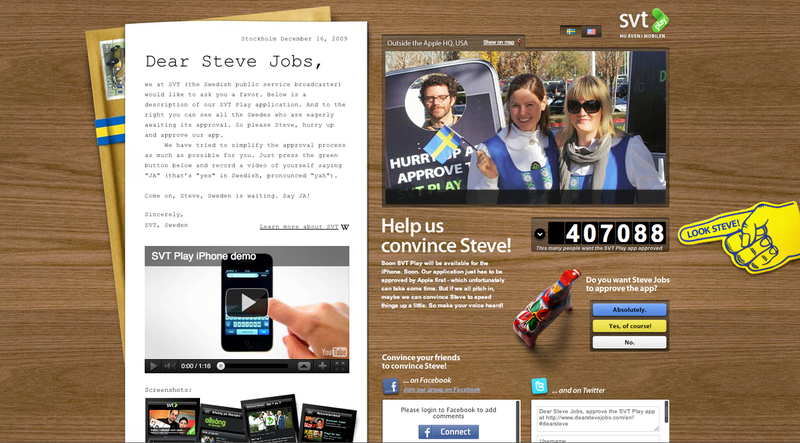 The Dear Steve Jobs website, dearstevejobs.com, included an open letter to Steve and invited Swedish fans to sign in with their Facebook identity, adding names to the petition convincing Steve of their support. The site featured a demo of the app and live video feed of the SVT reps outside of Apple HQ. Apple called STV execs in Sweden to say they loved the campaign and would try to treat the app application favorably. The Dear Steve Jobs campaign was developed at Forsman & Bodenfors, Gothenburg, by art director Adam Ulvegarde, copywriter Marcus Hagglof, web designer Anton Robsarve, web director Sophia Lindholm at Fantasy Interactive.